Maggie McGill paints for pleasure and relaxation after her hectic days as a psychotherapist. 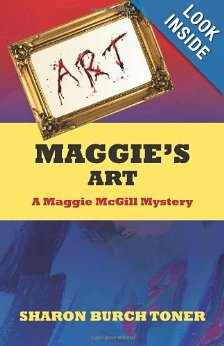 Then, suddenly, her art career takes off, thanks to her daughter, Allie, when Maggie has an exhibition of her primitive art paintings. A cold-blooded murder occurs at the vernissage and the two women are plunged into the mystery. At the heart of the novel, for me, is the warm, loving bond between mother and daughter. Both women are kind, generous, sympathetic and strong. Their mutual love and respect rang out so clearly. I was envious. I enjoyed this well-written, fast-moving novel. Plus the mystery kept me turning the pages and best of all, it is a completely clean read; no need to worry about coming across f-bombs or the like. I wholeheartedly recommend this novel to mystery buffs, and those who value strong, independent women.